If you’ve been reading this blog for anything length of time, you may have picked up on the fact that I’m a bit of a lunchbox freak. No really — it’s true! I’ve met very few lunchboxes that I haven’t wanted to fill up with tofu, strawberries and a whole wheat roll, so when the folks at OOTS! contacted me to see if I wanted to try out their Deluxe Lunchbox system, you can be sure I jumped at the chance. The OOTS! Lunchbox is a hard-sided box with a removable, semi-transparent lid on the top. The version we got was bright green with a purple strap. 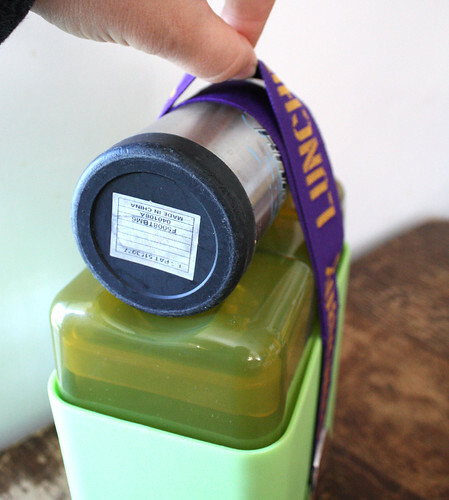 The lid of the Lunchbox is shaped to keep a water bottle in place under an elastic strap. The deluxe version comes with five inner containers — one big and four small. It’s made of BPA-free and phthalate-free polypropylene plastic and safety tested for lead. I washed the inner containers in the dishwasher several times and they didn’t warp. The company says that the inner containers are microwave safe too, but I haven’t tried that so I’ll just take their word for it. The first thing you need to know is that if you filled up all five of the boxes this set comes with, you will be sending WAY too much food to school for your average kid, especially if you’re only sending him off with lunch. I found that using three of the the boxes — the big box for lunch and the two little ones for snacks — was just right. I left out the remaining two boxes and that worked pretty well because it gave me a little extra space at the top of the box to pack a drink. It also gave me room for a couple of ice packs — one on top of everything and another sandwiched in the middle of the stack of boxes. 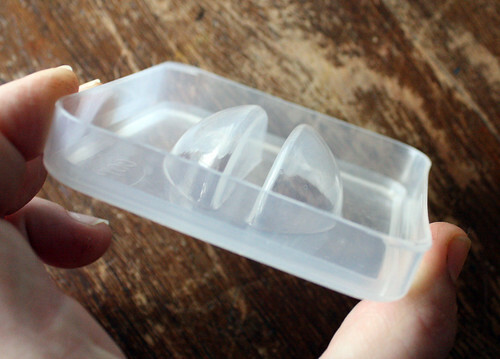 You can still fit an ice pack in the box if you use all the containers, but you would need to use one of the thin, gel kinds because there is only about a half inch of clearance between the inner containers and the top of the lid when it’s fully packed. Another thing to know is that if you are planning to pack your lunch bento-style, this system will present you with a few challenges. The inner containers are almost twice as deep as the bento boxes I normally use which made packing the food tightly enough to keep it from moving around and mixing together difficult. My beloved silicon baking cups only reached about half-way up the sides of the box, so they didn’t work too well as food separators. The handles that are built into the box lids make it easy to lift the inner boxes out of the lunchbox, but they stick down more than half an inch into the containers so I found myself removing food a few times in order to get the lids on tight. That being said, having so many separate boxes — all with lids — makes it pretty easy to pack a lunch for kids who don’t like their cheese and crackers to touch their blueberries. If I weren’t a crazy bento-addict I think this would be a non-issue. Another thing that I loved about this lunchbox is that it holds our wide-mouthed Thermos perfectly. You can see by this photo that the Thermos is exactly the same height and diameter as two of the little inner containers stacked on top of each other. I suspect this is a happy coincidence, but they couldn’t have made this a better fit if they tried. This makes the OOTS! Lunchbox even more flexible and useful than it already is. It’s good-looking — This lunchbox looks cool! It’s sleek and stylish enough for an adult to use, but the bright colors of this lunchbox are cheerful and kid-friendly too. Wyatt thought it was awesome and his five-year-old friends did too. True story: one of Wyatt’s buddies saw him using it at lunch time and asked his mom to ask me to show it to her so she could buy one for him. It’s flexible — You can pack as many or as few of the inner boxes into it as you like and configure them in a few different ways. 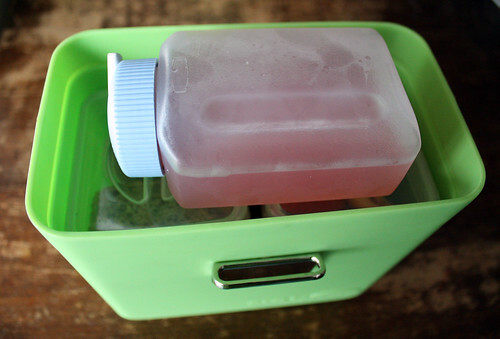 And don’t forget that you can slip a thermos into it and still have room for the big container and two little ones. It’s easy to clean — I popped the inner containers in the dishwasher and gave the big container a rinse at night and I was all done with clean-up. No hand-washing required! The lids aren’t water-tight — While the lids fit snugly, they are not water-tight. I would not be willing to pack applesauce or yogurt in them — especially for a backpack-swinging kid. It’s big — The OOTS! Lunchbox takes up most of the space in my five-year-old’s backpack and because it’s hard-sided you can’t squish it if you need to squeeze a few more things in the bag. An ice-pack isn’t included — I’ve noticed that ice-packs are often an after-thought with these big lunchbox sets and this one is no exception. When the box is fully loaded, you can make an ice-pack fit but it needs to be a small one and there isn’t a lot of wiggle room. I would also worry that the cold from a pack — even if you stick it between the inner boxes — wouldn’t keep food items that were farther away from it cool enough to stay safe in a backpack until lunch time. An adult taking this lunchbox to work would probably have access to a refrigerator, but kids rarely have that luxury at school. It would be fantastic if OOTS! would add a custom ice pack to this set to help insure food safety. It’s not cheap — The price of the OOTS! Lunchbox Deluxe is $46. It’s beautiful, well-designed, and sturdy and I don’t think that’s a crazy price to pay for a product of this quality. If you add up how much money you save bringing your lunch to work or school instead of buying it, you could quickly justify the cost of this lunchbox…for an adult. But for a kid…I don’t know. I would find it really hard to drop that kind of cash on a lunchbox for a boy who has lost three jackets in as many months. That being said, Wyatt has never lost even a decorative pick from one of his lunches, so maybe I would buy him something like this. I guess it would depend on the kid. I’ve packed several days worth of lunches in the OOTS! 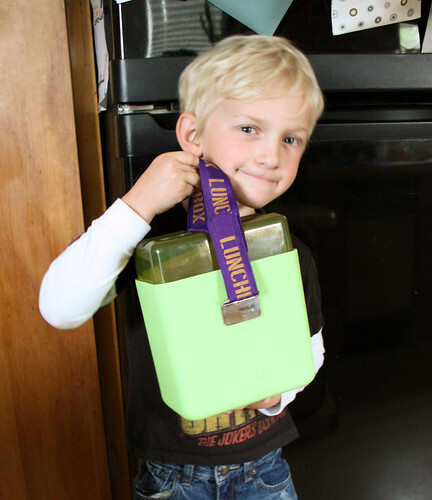 Lunchbox Deluxe and both Wyatt and I have enjoyed the experience of using this cool system. It was easy for me as the lunch-packer and fun for my five-year-old as the lunch-eater. I predict that this lunchbox will be used regularly for quite a long while. Disclosure: OOTS! sent me an OOTS! Lunchbox Deluxe to test out for this review and I liked it enough to tell you about it. Love reading your blog! I always enjoy the bento stuff and the cake recipes. Keep em coming. Happy early Mother's Day! more bento stuff would be great, although I like all of your posts! I really enjoy your blog! I like the bentos & crafts a lot. I think I would enjoy seeing more parenting & home making ideas, like creative educational projects & organizing ideas. Your Project 365 was inspiring, as is your goals for 2010. I am inspired by all of your posts, so thank you for sharing your life with us! I would love to win this! My youngest start kindy in the fall and there's no way she's eating the school food. I enjoy everything you post…pix, bento, crafts…just keep it comin'! I love the bento posts! I love all your posts, but the bento ones are very inspiring! Thanks for a chance to win this cool lunch box and for the review. I enjoy your style all around. 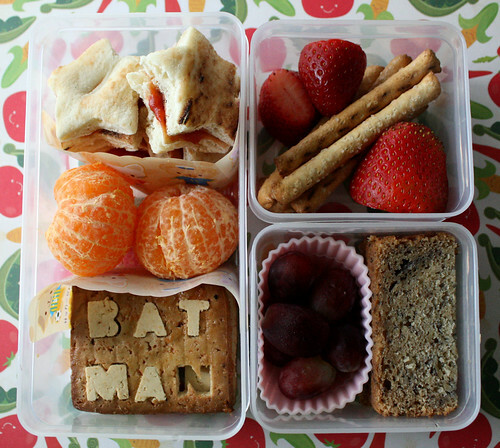 I like the bento posts the best (of course) but always enjoy the crafty stuff as well. Thanks for a fun blog. Pick me, pick me, pick me. More lunch box ideas. Food can be a chore, but your ideas make it fun and creative!!!! I love your blog. The bento posts are my favorite but I also really like when you show your week in pictures! I love this box. My husband would get a kick out of it…he is a kid at heart (I know everyone says that but he truly is). As for your posts I love them. Your pictures are so clear it makes me jeaous. I would love to know if you make your own tofu and if so recipes would be great. Have a blessed and relaxing weekend. I am new to your site, but I have thoroughly enjoyed reading the types of food combination's used for the lunches. The variety is fantastic. 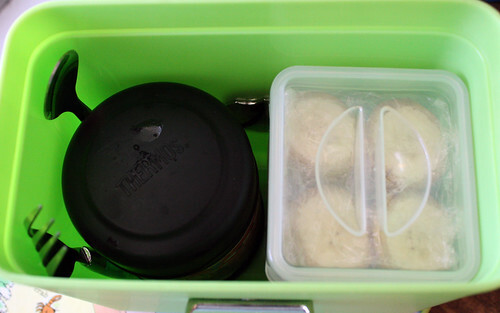 I've even tried to fashion a homemade bento box using tupperware. It doesn't all fit together sometimes, but it has really improved my child's bravery in trying new combinations. She's even letting me put rice under her chicken now! I would love to own a OOTS! Lunchbox Deluxe!! I SCROLLED TO BOTTOM OF PG TO CK. OUT THE GIVEAWAYS–NOTHING THERE! Interesting lunch system. It kind of reminds me of a torn apart tiffin that you can customize. I think it would work great for my hubby! I just came upon your blog thru another website and am so happy to find it! I love all your creative and different lunch ideas – I feel like we're always in a rut and you've inspired me to change things up…for my kids sake!! They'll love it! From what I've read so far, I really like the pictures you take to get the visual of what you're doing. Thanks for the awesome giveaway – I'll keep my toes & fingers crossed! Look forward to reading more of your blog! I usually come to your blog for your bentos. I enjoy the other posts, but I would definitely like to see more bento posts. I've been looking for a good lunch box! I would love to see a post on all of the materials(not food but containers etc.) you use to make lunches and where you got them. I LOVE this! I've been looking for a good lunchbox for my husband's work lunches, and I love the idea of bento boxes, but most seem to be more kid-sized – this one looks perfect! I've become obsessed with bentos since reading your blog. I would love to do something like this for my kids as an alternative to school lunches. I would love to see more bento related things on this blog. As of right now I haven't tried any of the cakes. I would love to see more info about all of the bento products you use (or wish you had). I really enjoyed your pics of your new bento boxes (and your enthusiasm when sharing)! So far I have really liked most posts! I love the 365 pictures project, the bentos of course ^_~ , recipes, and the reviews are helpful. I would love to see more resources for bento accessories…..I am in DE and I have no idea where to get the cute stuff you use. Thanks! I have been following your blog for a couple of months and i absolutely love it. I love the fact that you take the time to make your kids bentos everyday but still feed them healthy foods. I love how your so creative. I think i would love to see more recipes. But your doing a great job. I enjoy reading your blog. Ooh! I love that OOTS Lunchbox by the way. My friend introduced me to your blog about a month ago because my daughter was going to start preschool and I was really concerned about nlunch. I am a Kindergarten teacher and I see what most people send their kids to school with and I was terrified. Well, after reading your blog I have become inspired. My kid has been in school for a week and I love putting her lunch together! I try to make it as colorful and healthy as possible. I love your ideas… we have a laptop bento right now…so much fun! I also bought a bunch of the silicone dividers… I don't know who enjoys the lunch more…her or me. THANKS!!!! First off, I love this blog! It has completely inspired my lunch packing and also to make baked tofu, which my kids(3 1/2 and 11 months) both love. Would like to see more general family recipes that you use and what inspires you. Also could you include your baked tofu recipe? If it's on here please forgive me for not finding it….Would love to win this lunchbox! p.s. I completely relate to your FAQ question about why you do this, #4. Thanks for sharing that. I love your blog so much, I can not imagine it getting any better. HOWEVER, since you asked……..I love where you try new recipes. Your jams and such looked divine. AND I loved your retro cakes!! Cause I am just that type of girl!! And by the way, You Rock!! I would like to see more Bento stuff, links to buy bento products (that are BPA, etc safe), more ideas on what to pack in a Bento and I just love your pics!!! Also if you have pics of what lunch boxes you pack your bentos in so I can see how to pack everything in a lunch box/sack. I found your blog on Saturday while “blurfing” at Flickr in the bento lunch photos (looking for inspiration). I loved the photos of your children's lunches/snacks; I'm going to forward your blog to my daughter who has school-aged children. I think that you should post on your blog WHATEVER makes you happy, be it bento one day or crafts the next. Just found your site! Love it! I love tried and true recipes, so well-loved, people pleasing recipes are the thing for me! Keep up the good work! I kinda like seeing what your boys don't eat, though I sometimes wonder why you give them so much food. I'm not sure I'd be able to eat all the food in the lunches you pack them sometimes! I love your blog and I would love to see many more fattening cake recipes. Or any sweet things. I just found your blog and I love all the lunch ideas! I am just beginning my bento/lunchbox collection now. I don't have kids — my husband and I pack lunch for work each day. On second thought, maybe I do have a kid… my hubby eats like a picky kid! I would love to see more bento stuff — with recipes! Cool! I love all of your posts! More pictures would be fun, and I love your craft posts, too! Please pick me for this ultra-cool lunchbox! I love your bento posts and I'd love to see more of those in the future! Where do you generally buy your bento boxes?